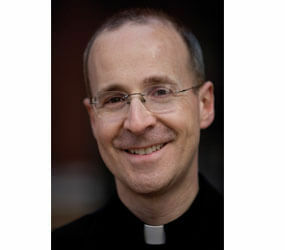 Jesuit Father James Martin is on a mission to get Catholics to lighten up. Too many people automatically associate being faithful with being dour, he said – exactly the opposite of how Christ and the saints lived their lives. 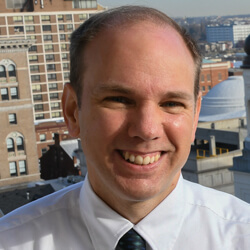 This fall, Father Martin will release his newest book: “Between Heaven and Mirth: Joy, Humor and Laughter in the Spiritual Life.” He is set to give a July 29 talk on the same topic as the featured speaker for the 17th annual St. Ignatius Day Lecture in Baltimore. The free talk begins at 7:30 p.m. at St. Ignatius on Calvert Street. Father Martin knows something about good humor. He is a frequent guest on Comedy Central’s “Colbert Report,” showcasing playful back-and-forth banter with the sharp-witted Stephen Colbert. The New York-based priest has even been dubbed the official chaplain of the popular show. People of faith are sometimes afraid to laugh, Father Martin said, because they misunderstand Jesus. Humor can be subversive, he said, which is why Christ’s natural humor may have been suppressed over the centuries. “That’s like saying, ‘nothing good ever came of Boston or Baltimore,’” Father Martin said with a laugh. Jesus showed his sense of humor, Father Martin said, by inviting Nathaniel to join the apostles rather than rejecting him. “It also shows that the evangelist had a sense of humor because he kept that in the story,” said the graduate of the University of Pennsylvania’s Wharton School of Business. Father Martin, who worked for six years in corporate finance and human resources for General Electric before becoming a Jesuit, believes reaching out to believers and non-believers alike through appearances on Comedy Central is a form of evangelization. He also takes advantage of Facebook and Twitter – daily tweeting 140-character homilies that reach more than 3,000 people. Visit www.catholicreview.org/matysekblog for more on this story.